The Mirror of Fate by T. A. Barron. A Merlin Book. Review: Have you ever fought marsh ghouls, kings, giants and other wizards? I think not. In the book Merlin the Mirror of Fate, by T.A. Barron, Merlin is a destined to be the greatest wizard there ever was. He is a determined boy that is willing to get anything done- no matter the consequences he will get the job done. This book is the fourth book in the Merlin Series. There is something strange happening on the mystical island of Fincayra and Merlin has found the problem. He has faced this place once before, and he doesn't want to face it again. It is the Haunted Marsh. He must visit frightening places and tackle challenges within him. He is on the verge of dying, and the mirror of fate can ultimately save his life. It is a portal of time, but very few people make it out of the portal. Many question remain, Will he make it out? Will he die? Find it out in Merlin the Mirror of Fate. I love Merlin the Mirror of Fate. It has the most interesting plot I have ever read. It explains the story line and characters in the story so well, that I can picture the world of Fincayra in my mind. This book is intended, for, readers 10 and up. This book is definitely good for a boy, reader, but some girls who enjoy Merlin's fantasy world may love it as well. Every Merlin book is equally thrilling. If you see more literature by this T.A. Barron, make sure you read it. I recommend this series, and I recommend the author. We would like to thank T. A. Barron for providing a copy of The Mirror of Fate for this review. 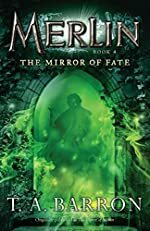 Have you read The Mirror of Fate? How would you rate it?